Book now the best shore excursions in Andalsnes. High quality and safety at the lowest prices. If your are looking for Shore Excursion Andalsnes, book now the best guided tours at lowest price with Ancora Tours. Since 2003 we offer you official guides in english, transportation and travel insurance, all included. The highest quality at the lowest rates. This scenic shore excursion journeys through some of Norway’s most picturesque land. We’ll travel through rich green valleys which rise into dramatic snow-capped mountains, and take the hairpin bends of the Trollstigen road to reach the awe-inspiring Stigfossen waterfall. What’s eating: Kjøttboller; a rustic meatball, served with mashed potatoes and cream sauce. 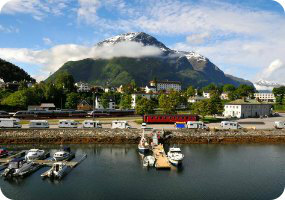 At the end of the beautiful Rauma railway lies the small town of Andalsnes, where our shore excursion takes place. The town itself may be small, but the surrounding mountains and fjords are among the largest in Norway. The green cliffs, with their snow-capped peaks provide Andalsnes with a breathtaking backdrop. The Rauma River was once famous for its top salmon fishing when travellers and aristocrats would come from all over to catch a prize Norwegian fish. During the Andalsnes shore excursion, we’ll admire the dramatic sections of the Romsdal Alps known as the Troll Wall. This sharp rock face is the tallest vertical rock face in Europe, over 1000 metres tall. Next, we’ll drive along the Trollstigen, a steep road that snakes up the mountainside and leads to Stigfossen Waterfall. From here, we can take some stunning photos of the scenery and of Trollstigheimen peak. At the end of this scenic shore excursion, we will return to the port for boarding.